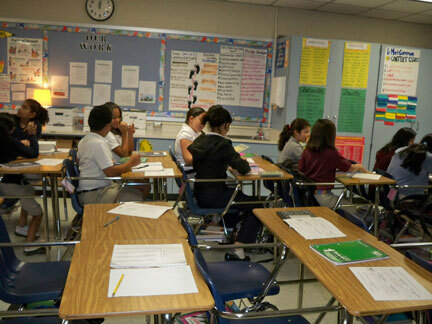 In this classroom (filled with big kids and big desks), half the students work with pairs in buddy reading. They read fiction books and talk about characters and character traits. They work together using a graphic organizer to think about characters and their traits (which the teacher modeled in whole group prior to students using this independently). 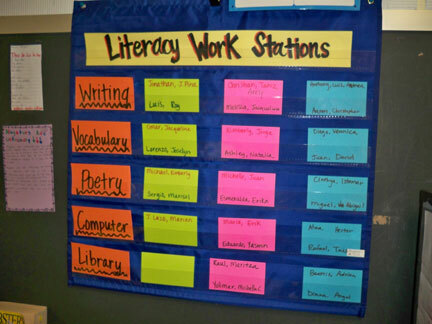 The other half of the class goes to literacy stations with partners, including poetry, vocabulary, writing, computer, and classroom library. Half the class does buddy reading using different books. 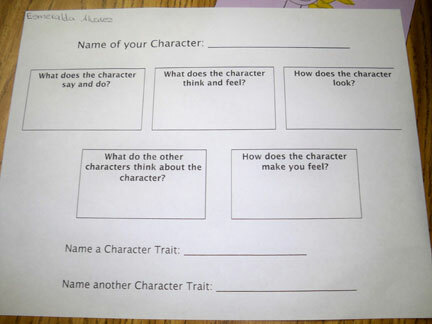 They use a graphic organizer to discuss and record character traits. 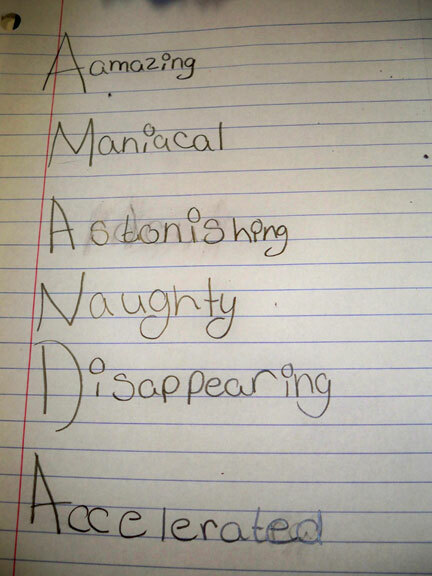 In another class, some students wrote acrostic poems using their names and character traits describing themselves. 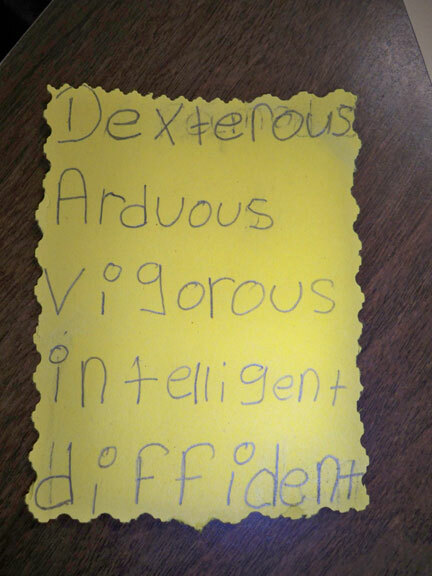 They also used a thesaurus as a reference for higher level vocabulary as they created their poems. The teacher provided fancy scissors, so they could create a special keepsake of their poem. Highly motivating for kids this age! Students write acrostic poems using their names and character traits describing them. Here is one for Elvis. And here's one for Amanda. 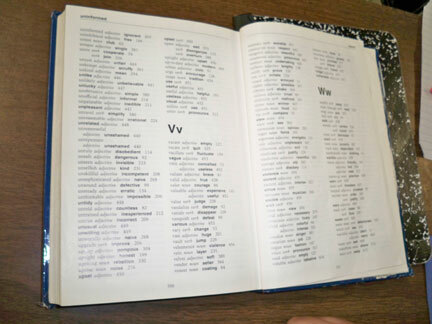 They use a thesaurus to find higher level vocabulary. 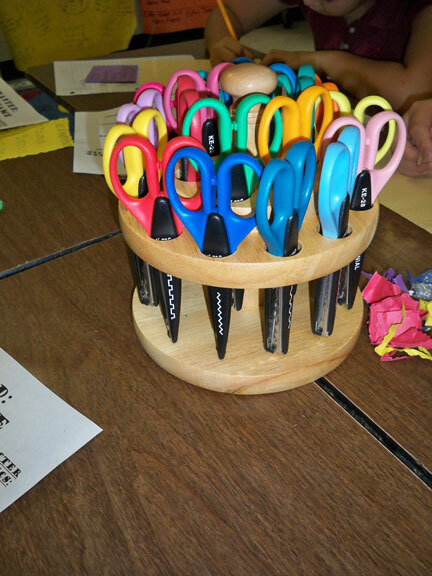 Fancy scissors are an inviting tool for creating poems to take home. 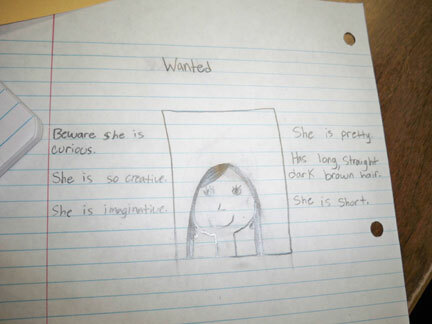 In several classrooms, students were working at literacy stations creating wanted posters. They were learning about personality traits and physical traits. Right now they’re making wanted posters about themselves, using traits. Down the road, they’ll make wanted posters about characters in books they’re reading, as they examine and analyze character traits. One thing I love about visiting Stehlik is the “transparency of their teaching.” I always know exactly what their objectives are because these are posted clearly in each teacher’s room. This helps kids know what’s expected of them, too. 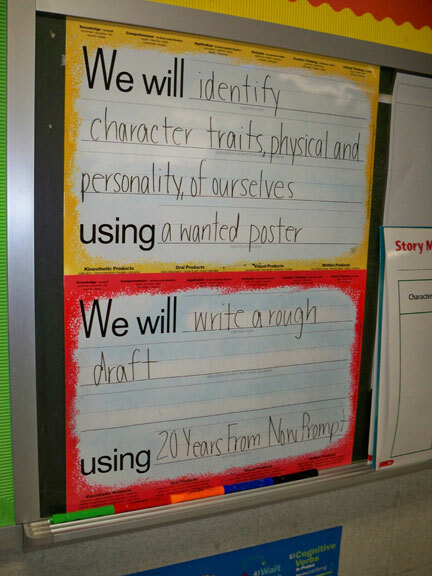 Learning objectives are posted in simple language for students to see. 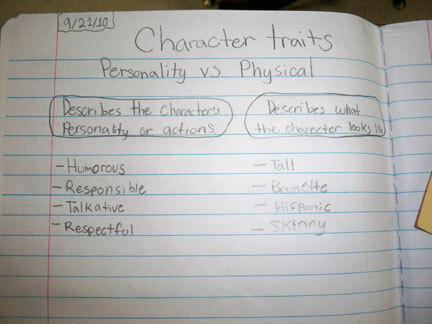 A student's notes about character traits (personality vs. physical traits) from whole group. 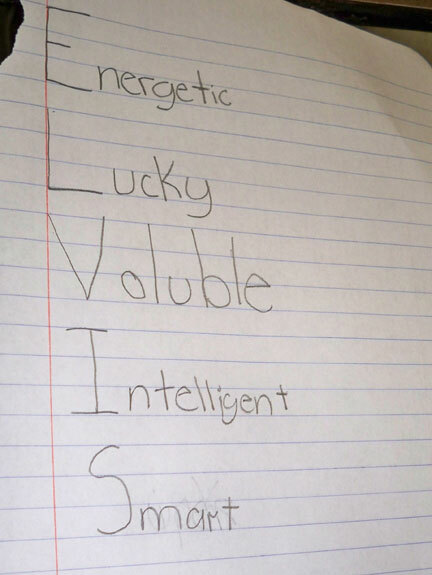 Wanted poster made by a 5th grader, describing her traits.